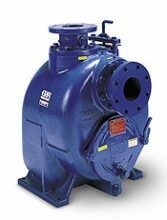 The self-priming centrifugal T Series® is the standard for industrial and sewage applications. The heavy duty construction and easy-to-service design have made Gorman-Rupp T Series pumps the standard in the industry. The combination of different sized pumps, impeller trims and speed variations ensure that the correct capacity pump will be matched to the exact requirements of your system, whether it's a small sub-division or a large waste collection system. These pumps feature a large volute design that allows them to reprime automatically in a completely open system without the need for suction or discharge check valves - and they can do it with the pump casing only partially filled with liquid and a completely dry suction line. Click the button below to add the Gorman-Rupp T Series to your wish list.